It’s hard to say where this film ranks in the history of car racing movies. The fact is, no one’s really been able to crack this genre, specifically the two other films from the same era, John Frankenheimer’s Grand Prix and Winning starring Paul Newman. Le Mans is the third of this late 60s/early 70s racing trilogy of sorts. There’s a strict adherence to racing realism in this picture, purposely eschewing any semblance of a story for a distinct vérité documentary-like feel. The first 30 minutes of the film is one long preparation scene, building up to the start of the Le Mans race. There’s almost no dialogue, save for the announcer telling the crowd, and thus the audience, the rules of Le Mans. It’s actually a very clever way to dance around the necessary exposition of the film, but the drawn out excessiveness of this opening is just too much to bear. Cinema nostalgics of the 60s and 70s will get a kick out of the frolicking and bouncy score, as well as the equally funky crash-camera zooms, off-kilter sharp editing and grainy film stock. 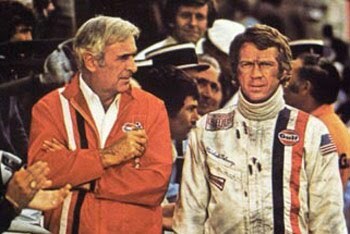 But ultimately, Le Mans is for McQueen aficionados and Euro-racing gear heads.